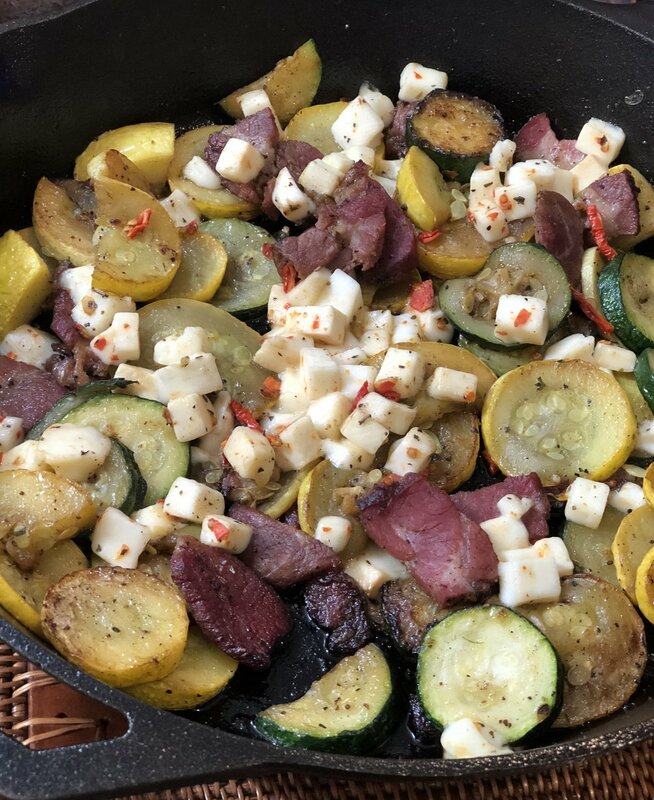 In a large skillet add the squash, zucchini, and bacon. Drizzle the Infused Sunflower oil over ingredients. Sautee over medium heat until the squash and zucchini are tender and the bacon is completely cooked. Add your feta cheese and garnish with an extra splash of Infused Sunflower oil! - While oven is preheating to 400° place chopped squash and sliced onions onto a baking sheet. - Drizzle the infused sunflower oil and sprinkle salt over veggies. Mix well with you hands or tongs and bake for 30-35mins. - While this is cooking start the noodles and next step. Make sure you salt and oil your water for the pasta, you will need some for the finish. I used the regular sunflower oil for this. - Start by cooking pasta per directions on the box along with the 2 tsp salt and 1 TBSP regular Sunflower oil. - While this is cooking heat a large skillet to medium high heat and add the Pumpkin oil and onions. - Once they start to brown just a little turn the heat down to medium and add the garlic and kale. - By this time the pasta should be done, do not drain your water, first add the 1-2 cups of pasta water to your bean mixture along with the Parmesan, salt, pepper, and nutmeg. - The water will help this mixture bind to the noodles. You can add them at this point and toss well. - To garnish and a little more Parmesan, a good piece of bread, and drizzle on the Pumpkin Oil over top for a nice finish. In a large skillet add Infused sunflower oil and cook chicken on medium heat until brown on each side and no longer pink in the center. Remove chicken and set aside. Add the heavy cream , chicken broth, garlic powder, Italian seasoning , and parmesan cheese to the skillet. Whisk over medium heat until it starts to thicken. Add the spinach and let it simmer until the spinach starts to thicken. Add the chicken to a baking dish and pour the rest of ingredients over it. Place the tomatoes on top and sprinkle with parmesan cheese and bake at *350 unitl tomatoes start to soften. Serve over your choice of pasta if desired! by Andrea Langstroth, Atlanta GA "Your Infused Sunflower Oil is Delicious!" Place the Potatoes in a large pot of cold water, add 1 tsp of salt and cook until potatoes are tender, but still firm, roughly 20-30 minutes (will depend on size- check by poking potatoes with a fork). Drain and let cool slightly. Slice each potato in half lengthwise then slice halves into 3 or 4 wedges, (depending on their size). Pour or brush wedges with infused sunflower oil. Grill until lightly golden brown (about 6 minutes). Using fresh asparagus, coat in Oliver Farm Infused Sunflower Oil on a baking sheet. Sprinkle with garlic , salt, and freshly ground pepper. Top with fresh grated parmesan cheese and bake for 20 minutes on *350. Marinate for 12 to 24 hours. Then grill or roast the chops /roast. Delicious!